6. Dating (and Smoking) Rick Newcombe’s Peterson Deluxe Billiard 5. Rick Newcombe has written a wonderful introduction for the upcoming Peterson book, which some of you may have read in Pipes & Tobaccos a few issues back. In his article, he discusses a meerschaum-lined Peterson as among his favorite Petes, which he recently sent me to photograph for the book, along with an invitation to smoke it. When Rick got the pipe back he says “the inside wood looked exactly like a popsicle stick.” But instead of behaving like an unsmoked pipe, the Peterson smoked like a pipe that had already been broken in! He talked to his pipe-making friends Jess Chonowitsch and Todd Johnson about the phenomenon, who speculated that the heat transfer through the old meerschaum lining had effected this magic transformation. Here is the Peterson pipe that was lined with meerschaum that I talk about in the introduction for the Peterson book. It says “Made in Ireland.” Can you tell what decade by the “Petersons Dublin”? The walls are thin, so I smoke this pipe very slowly. The wood is aged & broken in. Great pipe! This is Shape 5, documented in the 1937 Black & Silver K&P Catalog, p. 5. The shape number was applied only to the Deluxe line, which is confirmed by the light honey-colored finish and superb wood of your pipe as typical of K&P’s top of the line. Gary Malmberg has documented examples of the Deluxe (Classic Lines and System) pipes as early as the 1920s, although yours is not that old, for reasons explained below. 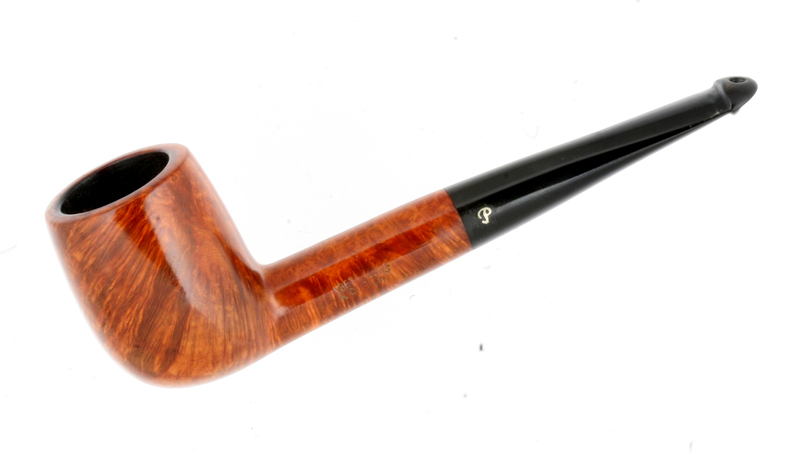 The mouthpiece on your pipe was hand-cut and originally fitted with a bone extension (as per the catalog, p. 1). You can see the threads for the extension. This either disintegrated (as they sometimes did over time) or was removed and thrown away, which is a pity, since the P-Lip actually delivers a better airflow with dryer smoke with the extension. I tried to fit a new aluminum extension (or “chimney” as they’re called at the factory), but the thread pitch is different. Apparently the extensions for Classic Lines pipes were of a different gauge than the vintage System pipes, which will accommodate the new extensions. Although K&P made meerschaum-lined pipes as early as 1905 (screw-in cups for “Captain Warren” type pipes), integral meerschaum-lined bowls for briar pipes are first documented in the 1945 Red catalog, which also lists your Deluxe shape 5 (p. 11). By that time the Dublin & London line had appeared to eclipse the Deluxe, which latter would henceforth be issued in a darker finish, leaving the D&L with the lightest stain. Shape 5 is not listed as one of the six meerschaum-lined shapes in the 1945 catalog. When you add this fact to your pipe’s block COM “MADE IN over IRELAND” and stain color, it seems quite reasonable that your pipe was made between 1937 and 1945. The silver P inlaid in the stem doesn’t occur until after 1937. The number of shapes for meerschaum-lined bowls was always small, usually only a half dozen, because each piece of pressed meerschaum had to be hand-cut to fit in the bowl, which also had to be re-bored. Yours must’ve been one of the first made. Now, as to its smoking properties. I confess at the outset that I was very skeptical about this being a great smoker—in my experience, those thin walls just couldn’t make such a thing possible. However, as per your advice—which was rather difficult for me—I just barely kept it smoldering. As you said, “it becomes an art to keep the pipe lit without allowing it to burn too hot.” This took a little effort, as I’m not a slow sipping smoker like yourself. But it paid off. Many smokers have remarked how you can usually tell with the first puffs whether the pipe is going to be satisfactory, unpleasant or spectacular. This one was spectacular. It’s evident you’ve smoked it quite a bit, but keeping the carbon-cake thin and keeping the pipe so clean doubtless contributed to my experience, as did the P-Lip. I’ve been smoking some fishtail billiard Petes lately, and while they’re great, like every billiard made they often need a pipe-cleaner at some point during the smoke to keep the moisture under control. I’m a dry smoker, so moisture isn’t usually a problem, but I can always tell a big difference between a fishtail Pete and a P-Lip Pete in that the latter will give me a more flavorful, dryer smoke, since the smoke is distributed over the entire palate instead of just the front part of the tongue. Your Deluxe 5 was no exception—it performed in the classic manner, made even better by the wood. Simply superb.